We are very excited for The World's Largest Golf Outing on August 3rd. WLGO is a Billy Casper Golf event where every BCG course holds an outing to raise funds for the Wounded Warrior Project. There will be prizes, giveaways, and a great day of golf! The weather looks to be great on Monday, with a high of 94! Visit https://www.worldslargestgolfouting.com/ for more details. 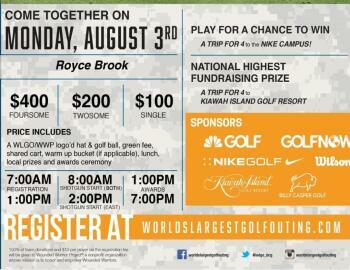 If you would like to be a part of this great event, give our Pro Shop a call at (908)-904-0499. Together we can make a big difference by supporting our wounded warriors.